Last night I arrived in Oxford in order to ensure I wouldn't be late to preach at Holy Mass this morning. It meant that I was able to get to David Howell's birthday party which took place in a function room off the High Street. What music are Oxford 20-year olds listening to these days? By the sounds of it, anything from the Sixties or Seventies. Good choice David! This morning, before Mass, I went for a walk through Christ Church Meadow. It was a lovely bright morning and a very enjoyable stroll. On the way back I heard my name being called and was surprised to meet two girls from my parish. They had travelled up on the Oxford Tube to be present at the Mass, not to hear me preach (they are tired of that I'm sure) but to be present for the CathScoc v Former CathSoc football match this afternoon. The Chaplaincy Mass is at 11.00am. The atmosphere at the Mass was very reverent and prayerful. It was well-prepared with the Missa de Angelis provided by the choir and a good group of servers. Afterwards it was nice to meet the students and have lunch with a good many of them. I enjoyed myself very much. Fr Jeremy Fairhead is doing a great job there. I can never have been easy to be Chaplain in Oxford. In some ways it is perhaps harder now than ever before. But Fr Jeremy works hard and has the support of a very fine body of students. It was nice to see that there is plenty of literature available for anyone who wants to know more about the faith, and also with prayers for before and after Mass, for study, and examinations of conscience to prepare for Confession. This afternoon I was able to be present at a meeting of the Vocations Group - a group of young men who are considering a vocation to the priesthood or religious life. It was good to meet them and I hope that they will all one day apply to their respective dioceses. 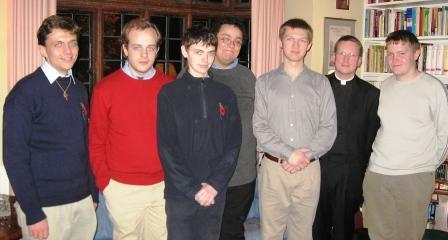 Later this year they plan to have a Vocations Retreat at Downside which seems a very good idea. The Vocations Group is an excellent initiative of Fr Jeremy and I am sure it will grow and get stronger as time goes on. Thank you for your inspiring sermon at The Oxford Catholic Chaplaincy. I notice that you didn't mention that you were "heckled" for suggesting that us CathSoc "Old Boys" might not last the match. In truth, you were right as I had cramp in both calves 20 minutes into the second half! The honours were even as we drew 3 -3. God Bless and good luck with the vocations drive. It was good to see you at the Chaplaincy. But you ducked out of the Vocations Meeting - now the cramp couldn't have been that bad!